As of right now the only two rooms that need some TLC are the dining room and kitchen, while I’m fairly certain I know what I want to do with the dining room, I am having major issues with the kitchen. My first issue is a big one because whatever color/pattern/theme/etc. goes in the actual dining area pretty much determines the rest of the kitchen as everything is connected. If you look close you can see that the only thing dividing the entryway and the kitchen is the change in flooring. 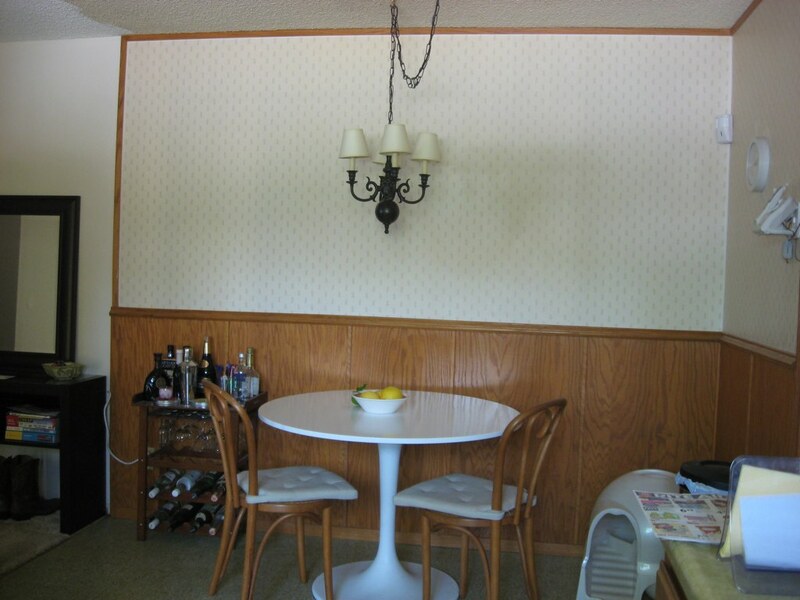 The dining area is made up of wood paneling and wallpaper. In order to take the rather ugly wallpaper down I have to take the wood paneling down as well. 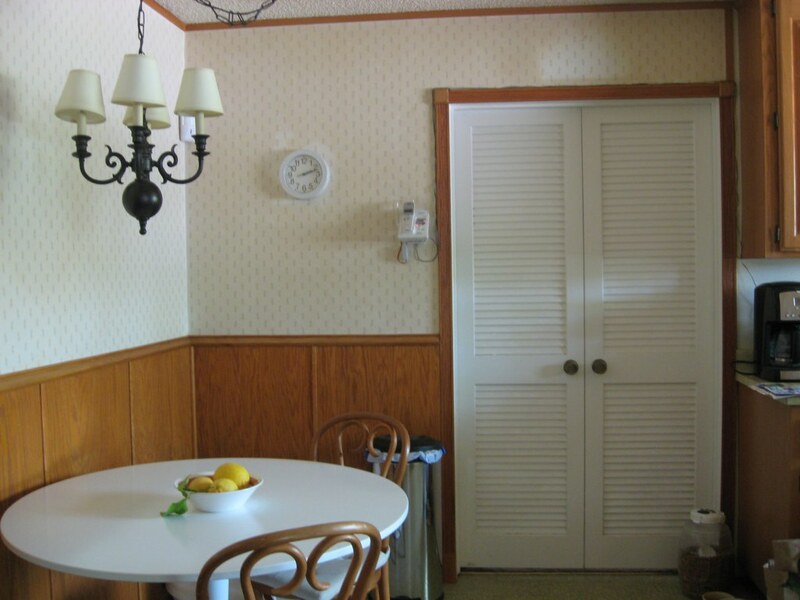 Now, at first my idea was to paint the paneling white and some kind of bold color in between; however I run into a problem because of how the kitchen is connected. Look closely at the trim around the doors and you can see the white space by the cabinets. I also find the trim coming up from the door and around the ceiling a bit tacky, not to mention we have to remove those for wallpaper removal and ceiling painting. Then comes the actual kitchen itself where I basically can’t touch anything except the light fixtures and walls. The countertop is what’s driving me nuts because it literally does not go with anything. Awhile back my Nana had avocado green appliances so she had the countertop match it. 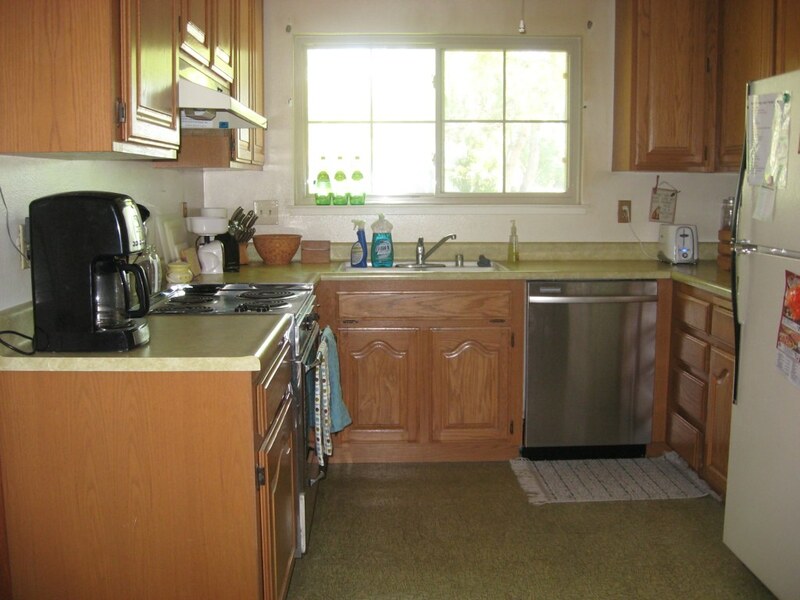 Later when she got new cabinets and appliances, she still kept the countertop despite it not matching a darn thing in there. I’d love to put some kind of black countertop and get a matching stainless steel fridge and hood range; however that’s something I doubt will happen in the near future because the house is owned by my dad and uncle, and anything major like that has to go through them. And considering all the work we have done, I’m pretty sure I’m getting on their nerves by now. The lighting is probably the only thing in the kitchen that I know how I want it to look. 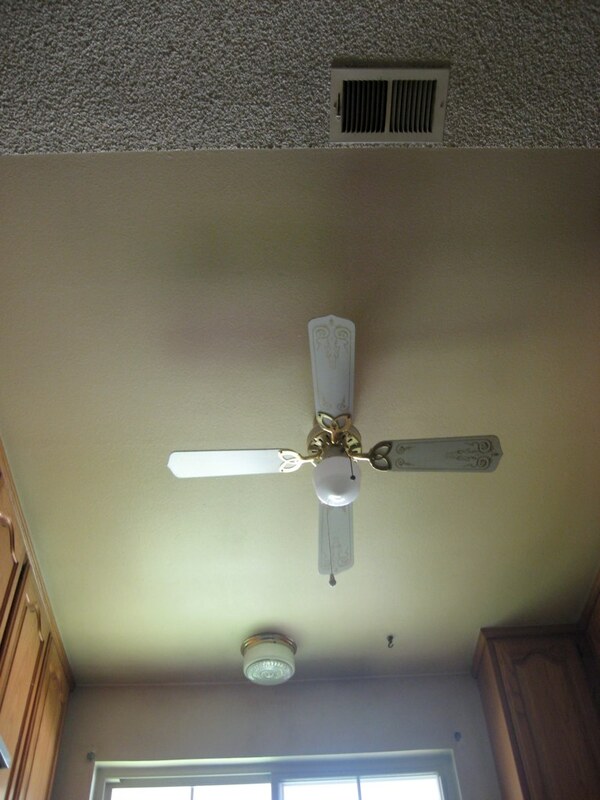 Instead of a ceiling fan I’d put in track lights of some sort since we have a fan via the hood range. The other light I’d have a hanging pendant, which I feel would look nice right in front of the window. I’d probably get two and replace the black chandelier over the table as well. So I don’t know. I’d really like to get going on the kitchen next, but I honestly have no idea what to do. What do you think?